You are currently browsing the category archive for the ‘Zaytuna’ category. Healing Hearts is honoured to introduce you to one of our beloved teachers Imam Muhammad Abdul Latif, who very kindly accepted a request to contribute to this blog. Imam Abdul Latif will be contributing to the “Thought for Thursday” inshaAllah. May we all find comfort, succour, benefit and healing from his words and reflections. Please keep Imam Abdul Latif, his family, teachers and us all in your prayers. 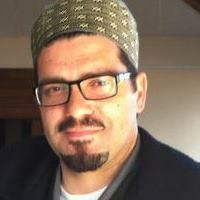 Muhammad Abdul Latif Finch is the imam at the Lighthouse Mosque in Oakland , California , and a teacher and program developer for Deen Intensive Foundation. He also works with SeekersGuidance and assists Zaytuna College ‘s annual Summer Arabic Intensive program in Berkeley , California . He is one of five students who comprised the first graduating class of the Zaytuna seminary program. Born in El Paso , Texas , and raised in the south, Abdul Latif embraced Islam in 1995 in Atlanta , Georgia , when he was 20 years old. He subsequently traveled throughout the Muslim world and, in 2002, relocated with his family to the San Francisco Bay Area to take advantage of the resources of knowledge and the community that had formed around Zaytuna Institute. There, he spent his initial year of studies under the tutelage of Shaykh Salik bin Siddina. In 2004, he was accepted as the first of three initial students into Zaytuna’s pilot seminary program. He studied at Zaytuna with several teachers, including Imam Zaid Shakir, Shaykh Abdur Rahman Taahir, Qari Umar Bellahi, Shaykh Abdullah Ali, and Shaykh Yahya Rhodus, until he graduated in 2008 with an ijazah in the basic sciences of Islam. Since graduation, he has had the honor of tutelage under Dr. Umar Farooq Abdullah, Shaikh Mahi Cisse and Shaikh Abdulllah Ibrahim Niasse. Healing Hearts is honoured to introduce you to one of our beloved teachers Imam Muhammad Abdul Latif, who very kindly accepted a request to contribute to this blog. Imam Abdul Latif will be contributing to the “Thought for Thursday” every Thursday inshaAllah. May we all find comfort, succour, benefit and healing from his words and reflections. Please keep Imam Abdul Latif, his family, teachers and us all in your prayers. Healing Hearts is humbled and honoured to introduce you to one of our beloved teachers Imam Muhammad Abdul Latif, who very kindly accepted a request to contribute to this blog. Imam Abdul Latif will be writing the “Thought for Thursday” every Thursday inshaAllah. May we all find comfort, succour, benefit and healing from his words and reflections. Please keep Imam Abdul Latif, his family, teachers and us all in your prayers. will be writing the “Thought for Thursday“ every Thursday inshaAllah. May we all find comfort, succour, benefit and healing from his words and reflections. Please keep Imam Abdul Latif, his family, teachers and us all in your prayers.